Well, the year 2013 is rapidly moving into our rear-view mirror, and so goes another year of posts here on Reflections. In more specific terms, in 2013 the blog celebrated the 20th anniversary of The X-Files, marked Star Trek Week for the release of Into Darkness, Superman Week for the premiere of Man of Steel, and even had The Lone Ranger Week. 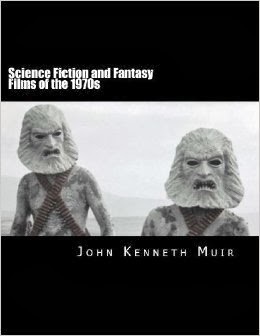 The year also saw the release of my books, Horror Films FAQ and Science Fiction and Fantasy Films of the 1970s. As I've written before, these books are the gasoline that keeps the engine of the blog running, so if you can spare the money, please think about supporting my work in print (or e-book form). It helps. A lot. Not long ago, the blog also celebrated the fiftieth anniversary of a certain time lord for Doctor Who Week. I also reviewed all the Indiana Jones films. On Saturdays, I covered Star Trek: The Animated Series, Return to the Planet of the Apes and the first season of the 1990s Land of the Lost. And on Sundays, I blogged Star Blazers season one, and Joss Whedon's Firefly. We also had time to remember the life and career of those we lost this year, including genre giants Richard Matheson and Ray Harryhausen. Most importantly, I'll always remember 2013 as the year we undertook the Reader Top Ten together for the first time. In 2013, readers selected the best science fiction movie of all time, the greatest sf movie character, the greatest science fiction movie 2000 - 2013, the best horror film 1960 - 2000, the best science fiction film of the 1970s and the greatest toys of their childhood. As 2014 -- my ninth year of blogging -- looms, so does a set of new anniversaries. In the twelve months ahead I'll be gazing back at the films of 1984, for instance, and celebrating The Terminator's 30th anniversary. 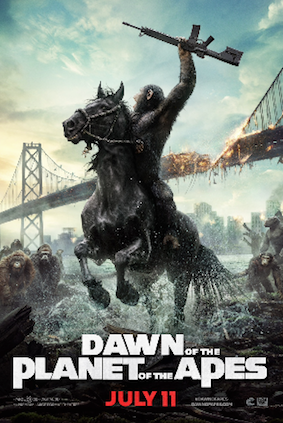 Upcoming 2014 releases sure to merit attention include Dawn of the Planet of the Apes, Robocop, Godzilla, Veronica Mars, Christopher Nolan's Interstellar, and Max Max: Fury Road. In the next few weeks, I'll also be reviewing all the Riddick films, the Back to the Future films, and I'm toying about re-visiting the entirety of the Die Hard franchise too, if readers are interested. Not a bad year. I jumped off a cliff–almost died. So, that happened. Altogether, though, it coulda been worse; I mean, there was no alien invasion or anything. Yeah, your 'Top Ten Reader' gig was fun. Will that continue through 2014? What other categories do you have in mind? Hell, what other categories are left? Anyways, pretty good year for movies. I already posted my favorites. What were yours? P.S. Only 5 more years away from Blade Runner. "A new life awaits you in the Off-world colonies. A chance to begin again in a golden land of opportunity and adventure." Well, first off, I'm glad that you didn't die during your cliff-jumping excursion! Let's hope there are no more brushes with mortality in 2014. On a more pedestrian (and safer) note, I feel very lucky to have read your excellent comments this year, and your blog-posts as well. I am planning more "Reader Top Tens" but I have no idea yet for the category. 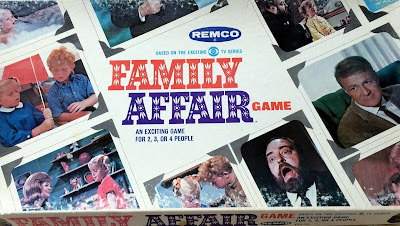 I'm thinking about moving into the 1980s, and doing some regarding cult-television, but we'll see. Have a happy new year, my friend! Will you top off your Firefly retrospective with a review of Serenity? John, you are a really prolific blogger. Thanks for the great articles and reviews! I am already waiting for the Back to the Future reviews. Thank you, T.S.! I am looking forward to re-watching all the BTFB movies. Have a happy new year! Thanks for another awesome year on the blog! Can't wait to see what the next year brings us here. Happy New Year, my friend. I have enjoyed reading all your comments this year (and in previous years), especially since we are both fascinated by/obsessed with found footage films! Thank you for all those articles, John. Happy New Year! Wonderful work throughtout, John. Happy New Year, my friend. Congrats on a wonderful year, John. You really outdid yourself and delivered the good. You certainly inspire me to keep on blogging and writing. I've really enjoyed the blog and the top ten reader lists this year. Looking forward to 2014!